Locusts are relished by all insectivorous reptiles, amphibians, invertebrates and mammals; not only lizards, spiders, frogs centipedes and mantids, but exotics like monkeys and sugar gliders and our smaller pets like ferrets, rats and hamsters. 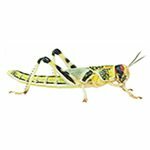 T hey are much more user friendly than crickets as they are not as aggressive and they are SILENT, apart from being pretty their taste seems to be preferred, once many lizards are used to these, they very often will not revert back to crickets. The sizes are approximately as follows; small … 1cm medium … 1.5 – 2cm large … 2 – 2.5cm extra large … 3 – 3.5cm We stock small, medium, large and extra large hoppers and can order them in a range of pack sizes to suit your needs, 50, 75, 100, 150 and 200, on separate listings. As with all live foods, it is imperative that they are “Gut loaded” (fed) to make them a complete meal, nutritionally. Apart from appropriate vegetation, a proprietary complete dried diet (bug grub) and a gel (bug gel) for hydration, is important. Feeding them a balanced diet also helps to balance the necessary calcium/phosphorus ratio. It is pointless feeding a starving and de-hydrated insect to our beloved pets. Any orders placed before 3pm will be dispatched the same day, after that it will be dispatched the next available shipping day by 1st class Royal Mail. We send out our live foods Monday to Thursday, if, however you urgently need some live food, next day Saturday delivery could be arranged at the extra cost set out by Royal Mail for this service, which would typically be an extra £5.25. Birmingham Reptiles and Pets thank you for your interest and if you have any queries, or would like to know whether we stock any item that may not yet be listed, please do not hesitate in contacting us. Locusts are relished by all insectivorous reptiles, amphibians, invertebrates and mammals; not only lizards, spiders, frogs centipedes and mantids, but exotics like monkeys and sugar gliders and our smaller pets like ferrets, rats and hamsters. They are much more user friendly than crickets as they are not as aggressive and they are SILENT, apart from being pretty their taste seems to be preferred, once many lizards are used to these, they very often will not revert back to crickets. The sizes are approximately as follows; small … 1cm medium … 1.5 – 2cm large … 2 – 2.5cm extra large … 3 – 3.5cm We stock small, medium, large and extra large hoppers and can order them in a range of pack sizes to suit your needs, 50, 75, 100, 150 and 200, on separate listings. As with all live foods, it is imperative that they are Gut loaded(fed) to make them a complete meal, nutritionally. Apart from appropriate vegetation, a propriatary complete dried diet (bug grub) and a gel (bug gel) for hydration, is important. Feeding them a balanced diet also helps to balance the necessary calcium/phosphorus ratio. It is pointless feeding a starving and de-hydrated insect to our beloved pets. Any orders placed before 3pm will be dispatched the same day, after that it will be dispatched the next available shipping day by 1st class Royal Mail. We send out our live foods Monday to Thursday, if, however you urgently need some live food, next day Saturday delivery could be arranged at the extra cost set out by Royal Mail for this service, which would typically be an extra £5.25. Birmingham Reptiles and Pets thank you for your interest and if you have any queries, or would like to know whether we stock any item that may not yet be listed, please do not hesitate in contacting us.